AWS IoT is a managed cloud platform that lets connected devices communicate easily and securely. It also makes it easy to interact with cloud applications and other devices. With AWS IoT, you can filter, transform, and act upon device data on the fly, based on business rules that you define. You can update your rules to implement new device and application features at any time. In this post, you’ll explore two of these integrations: Amazon S3 and Amazon Kinesis Firehose. The architecture you’ll design is shown in the figure below. You’ll set up your breadcrumbs to flow into S3 via two paths: directly, and also via Firehose. From there, you’ll access them in Amazon EMR using Apache Hive, and show your vehicles on a map using Hue. You’ll also use CloudWatch Logs for debugging purposes only. In IoT, each defined sensor or device – in this case, each vehicle – is called a “thing”. Each thing that communicates with the IoT service is defined in IoT’s Device Registry. You can create a definition in the device registry by using the “aws iot –create-thing” AWS CLI command, by using the AWS Management Console, or by using one of the SDKs. (Note: if you’re using the AWS CLI, make sure you have version 1.10.24 or higher). You give your thing a name, and you can define up to three attributes. These attributes are useful in grouping or locating specific devices; common choices for these attributes are the model number, serial number, or owner. The attributes are part of the metadata about the device itself, separate from its operational characteristics (including the sensors and their values). After you have defined a thing, you can connect your device securely to it using one of the supported protocols: HTTP, HTTP/2, or MQTT. When connected, the device reports its status by publishing an event to the “update” topic. For each change, IoT also publishes an event to the “documents” topic, containing both the previous and current state. You can communicate with the thing shadow (and therefore with the thing itself) by subscribing and publishing to topics. You can send “desired states” to its device shadow (that is, by sending a message to the appropriate topic), whether or not the thing is currently connected. The next time the thing connects, it reads its shadow and, hopefully, acts to synchronize its state with your desires. The events themselves are ephemeral and are not stored in AWS IoT (other than the latest state). However, IoT has a built-in rules engine, which provides message processing and integration with other AWS services. In the rules engine, you use an SQL-like language to select data from message payloads, process the data, and send the data to other services. The shadow state also includes a version number. Each time the shadow is updated, the version number is automatically increased. In your downstream app, you can use the version number to keep track of the order of changes or which changes you’ve processed. Because of IoT’s pub/sub design, you can imitate a set of devices by creating the messages that those devices would send, and publishing them onto the relevant topics. For this post, you’ll use an event generator that creates a set of vehicles in the IoT device registry. It then generates a set of update breadcrumbs, modeled on the real breadcrumbs of a set of vehicles. From IoT to Firehose to S3. Finally, you’ll start an EMR cluster with Hive and Hue to analyze and display the data. Before diving in to the scenario, some words about using IoT topics for testing, and debugging. 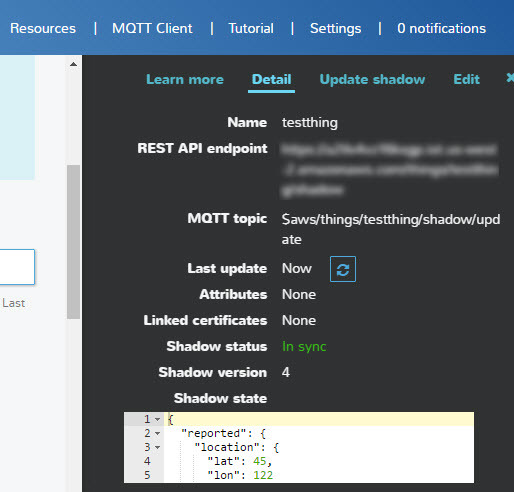 A simple approach to understanding the shadows, the message flows and their content as you start developing an IoT application is to use the tools on the IoT console. Open the IoT console and choose MQTT Client. 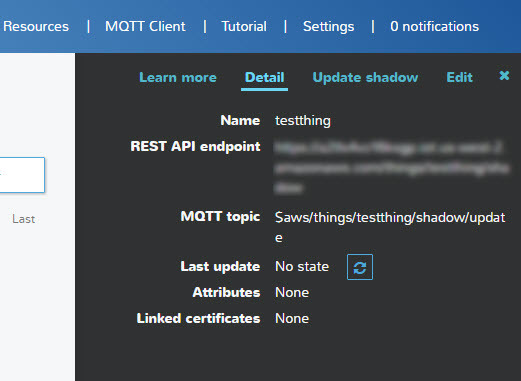 Under MQTT Client Actions, choose Device Gateway Connection, enter a client ID (e.g., “12345”), and choose Connect. Choose Subscribe to Topic, enter the wildcard # for the subscription topic (includes all topics), and choose Subscribe. You’ll get a new browser tab telling you that you don’t have any messages on this subscription. In the IoT console, follow the instructions in Create a Device in the Thing Registry to create a new thing, called “testthing”. Select testthing, choose View Thing, and review its details. Back under your MQTT Client, the # tab shows the name of each topic that received a message, along with the message contents. In this case, the “$aws/things/testthing/update/accepted” topic shows the payload sent, and the “$aws/things/testthing/update/documents” topic shows a JSON document with the previous state (here, null for no state), the current state and some metadata. One of the most useful resources for debugging your IoT integration with other services is CloudWatch Logs. Follow the instructions at Setting Up CloudWatch Logs to create an IAM role for logging and a trust policy for the IoT service endpoint (iot.amazonaws.com), and to register the role with IoT. For now, use logLevel=“DEBUG”. The CloudWatch log entries appear under the log group name of “AWSIoTLogs”. Each thing has a separate log, under its name. The actions specified for that rule appear as a separate message later in the log. Now start to refine which events you’d like to capture and store. IoT uses a simplified SQL syntax that provides you with a small set of functions, and lets you access the topic name and the event content. This rule outputs the entire event contents (*). You could have selected only specific fields from the event, using the IoT-provided JSON extensions. You’ve added two other fields into the output: the whole topic name (“topic()”), and the thing name, extracted from the topic (“topic(3)”). The topic filter specifies that you want all things (the ‘+’ wildcard in the “<thing-name>” section of the topic name), but you only want the “update/documents” topics. You then limit which specific things you’re interested in to those that start with the given naming convention. Now, add the actions (here, three of them) that you wish to take for the events that match this rule. Choose Store the message in a file and store in the cloud (S3). Choosing this action is the shortest path for getting events written from IoT to S3. Using this action, IoT writes each event to a single file in S3. However, a number of the partitions in this name are redundant (‘/$aws/things/’, ‘/shadow/update/documents/’), and others are inconvenient (‘$aws’ is interpreted by Hive as a request for the value of a variable called aws to be provided at runtime). Choose the S3 bucket to which to write the events. For simplicity, choose a bucket in US-West-2. Choose a role that allows IoT to write to S3; or, allow IoT to create an appropriate role for you. This pattern allows you to create a Hive table partitioned on thingname. For event rates significantly higher than those generated by your sample application, consider the likely data usage. S3 performance considerations dictate a naming convention with differentiation earlier in the key if you are generating many S3 requests. Performing GETs of many small files may not be optimal for your target big data application, and may affect its performance. In addition, each S3 PUT, GET or LIST event incurs a small charge, so this approach may not be the most cost-effective choice. If you choose Create a New Resource, you’ll be taken to the Firehose Create Delivery Stream page. Here, you can define your delivery stream: give it a name (e.g., “iotfleet”); select an S3 bucket, and provide a prefix (e.g., “iot/iotfleet/firehose/”; and make sure you include the “/” at the end of the prefix name). Keep the other defaults, but choose an IAM role: either an existing role, or allow IAM to create a new role and associated policy with the right privileges. This role allows Firehose to write to S3. Choose n (newline) for your separator. This adds a newline at the end of each event, so that your Firehose file contains a line per event. Without the separator, all events are written to a single line in the file, making them uninterpretable by many downstream tools. Choose a role name that lets IoT send events to Firehose, or create a new role. Each event is represented as a single line in the output file. Each file that Firehose outputs contains the events that matched the rule within a similar time period; thus, a file may contain events generated by a variety of things. It is now particularly important to have terms in the event that allow the event to be matched to the source thing. If each thing is easily recognized from the events it sends, that’s easy. If not, or if the identifier in the event is not easily relatable to the thing name in the device registry (which is how you communicate back to the device), adding the topic or thing name to the event in your rule (as you did above) makes the output much more usable. You can use Firehose parameters to choose the batch size (S3 buffer size, in MB) and frequency (Firehose buffer interval, in seconds). You can trade off latency (as a new file is not written until either the time or size limit is reached) with the efficiency of larger files. Now create a fleet of vehicles in IoT and move them around, generating a set of breadcrumbs with their current location and their new speed and heading as they move. To check for correct operation, look at the log files created by the generator (by default, in the local directory) for success or errors, the CloudWatch logs to see whether IoT rules are being matched, and the S3 buckets that you’ve configured for the output files. For Firehose, check the Monitoring tab for your delivery stream; with some delay (give it a few minutes) in the displays, you should see activity in the IncomingRecords and then DeliveryToS3 charts. Now, add the files to the Hive metadata store in EMR, and set it up to automatically update the metadata store on a regular basis with new files. If you are not running your cluster in US-East-1, you will need to copy iotfleet-hive.sql and iotfleet-hive-update.sh into your own S3 bucket and adjust the paths above accordingly. What do these two steps do? Each JSON SerDe is a little different in its capabilities and restrictions, and some experimenting is often needed to get good results. In each table, each row is defined as a single string, for later parsing into JSON. With this approach, each event can be read and parsed in different ways using string functions if desired. Note that in the third definition, for table fleet_s3p, the “thingname=” added into the S3 filenames allows Hive to interpret it as a Hive partitioned table. The other two views (creatively named fleetinfo_s3 and fleetinfo_s3p) are similar, with fleetinfo_s3p defined as a Hive partitioned table. This script runs the Hive script on a regular basis (currently every 60 seconds), to catalog the new files that have been added to S3. When the query returns results, choose the Chart tab. Choose a chart type of Marker Map. In the list fields, choose lat, lon, and thingname, and you should see the last 10 minutes of data displayed. Note that fleetinfo_fh’s results will lag by the time taken for Firehose to create its next batch (configured in Firehose with “S3 buffer interval (sec)”). You’ll need to reissue the query every few minutes to see your latest data. To issue the same query against fleetinfo_s3 and fleetinfo_s3p, precede it by the same Hive set recursive parameter as above. It should give the same results. However, the performance characteristics of Hive across these 3 versions will differ; for example, with many individual files in s3, you may see timeouts in Hue. The partitioning approach reduces that risk in the case where your query can be limited to a subset of partitions (which the above query does not do). For production, partitioning will be needed for good query performance; for example, partitioning by (year, month, day, hour) for a large fleet or if there are frequent updates. The story does not end here, and probably shouldn’t. When I showed him the dashboard, Bob said (predictably), “Great! Now I’d like to know which truck drivers are speeding, and how often – it could affect our insurance rates. And for the refrigerated trucks with temperature sensors, notify us when the temperature rises so we can take immediate action – it’ll reduce the spoilage rate. And… “ But these are topics for a future blog post. Now that the event contents are easily accessible, it’s easy to write SQL to perform any desired transformation and store the results in your preferred data format, such as Parquet. Depending on your data volumes and analytic needs, you may wish to consolidate the smaller S3 files on a regular basis, such as nightly. Other suggestions can be found in the Using CombineInputFormat to Combat Hadoop’s Small Files Problem blog post. You can then have a lifecycle policy to delete the S3 files or archive them, if desired. You’ve now seen how to interact with IoT, create events, and identify the subset of those events you’re interested in storing for later processing. You’ve seen two methods for storing your IoT events in S3, with a choice of data layouts. You’ve set up the Hive metastore to recognize the new event files as they are created, and set up views over the files so you can easily perform analysis on the contents. You’ve created a map that shows the locations of your vehicle fleet. Now you can now analyze the data flowing in from your IoT events, using all the usual capabilities of your big data platforms. Your analysis programs can even send messages back to your things for them to act on. Enjoy!